A CO Armagh woman who spent two years in a London hospital because in-patient treatment for her eating disorder was not available in Northern Ireland has called on the Health Minister to establish a specialist unit here. Aileen Uí Dhonnghaile was 24-years-old when she was transferred to St George’s Hospital in London in 2006. Her anorexia had become so serious that she was in need of full time specialist in-patient care for the condition. Ten years on there is still no such service available in Northern Ireland. In October last year the Health Minister, Simon Hamilton, announced that his officials were “examining the possibility of establishing a specialist eating disorders unit”. However a preliminary report published by his department last month stated that while there was potential for a unit it found that “further study is required”. A spokesperson for the Department of Health said: "The second phase of the study will review and assess the most recent policy, medical and service developments, cases, reasons for transfer to Great Britain, local best practice, and gaps in current service, to determine whether the landscape is such that a specialist unit is necessary." Serious consideration will also be given to enhancing community based services. However Aileen Uí Dhonnghaile believes the issue needs resolved sooner rather than later. She said: “It was very difficult for me to go and leave my home and go to England for treatment and it had a huge impact on my family. We were all basically being uprooted and I had to go to another country. There were really two parts to the illness; one part of me really knew that I had to go to England and another part was fighting against that and trying to make me not go. Mrs Uí Dhonnghaile is now 34-years-old and works for the Eating Disorder Association for Northern Ireland (EADNI). It provides the only full-time regional support group for eating disorders in Northern Ireland. Her comments comes as the organisation faces closure as a result of budget cuts. The preliminary report published by the Department of Health last month confirmed that the organisation was “in jeopardy” due to the planned phased removal of department contracts over the next three years. Meanwhile The Detail has obtained new figures which show that £80m has been spent during the last three years on sending 3,000 patients outside of Northern Ireland for various types of medical treatment, including £4.3m for eating disorder specialist in-patient services. Patients were treated for a broad range of reasons including organ transplants, rare cancers and psychiatric conditions. The majority of people were sent to other parts of the UK or the Republic of Ireland, but patients were also transferred to countries such as France, Germany and the USA. An Extra Contractual Referral (ECR) involves patients being sent to different countries when the necessary treatment is not available in Northern Ireland. This can be because the treatment needed is of a specialist nature which is not available in Northern Ireland or because there is a clinical reason why the local service is not appropriate. Patients may also be sent away as part of a waiting list initiative. Through a Freedom of Information request we asked the Health and Social Care Board (HSCB) to provide a breakdown of all ECRs approved in Northern Ireland since 2012 as well as a breakdown of the cost. 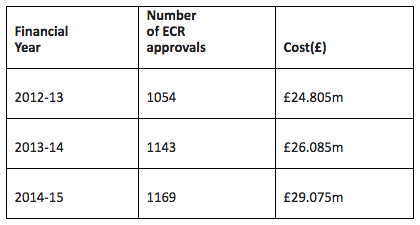 The figures show that 3,336 ECRs were approved at a total cost of £79.9m. We also asked for a breakdown of the types of treatment patients were being sent away for. HSCB said that because “small numbers of patients had travelled to specific locations for treatment of unique conditions, providing this information had the potential to identify patients and impact on their privacy”. However in a response to a written assembly question by the SDLP’s Fearghal McKinney in February this year, the Department of Health provided a breakdown of the category of treatment ECRs were approved for over the last three years. In Northern Ireland there is currently no specialist in-patient eating disorder service available. Patients who are in need of in-patient treatment are either treated as mental health in-patients in local hospitals, or in the cases deemed most serious they can be sent to England for specialist treatment through an ECR. In response to a query from The Detail, the Department of Health confirmed that there were 34 ECRs relating to eating disorders since 2012 at a total cost of £4.3m. In October 2015 the Health Minister, Simon Hamilton, announced that he had requested officials to examine whether there was a need to establish a specialist eating disorder unit in Northern Ireland. A preliminary report was published by the Department last month. The report found that while there is the potential for a specialist in-patient unit in Northern Ireland, it stated that “more evidence-gathering is required to allow for an informed recommendation to be made, and further study is required”. The second phase of the study is expected to conclude by the end of 2016. The report also provided some figures on the number of individuals from Northern Ireland being treated for eating disorders through ECRs. Twenty-four people were treating through ECR arrangements between 2010 and 2015, with two people placed prior to 2010 who had remained in these placements for the totality of the five-year period. 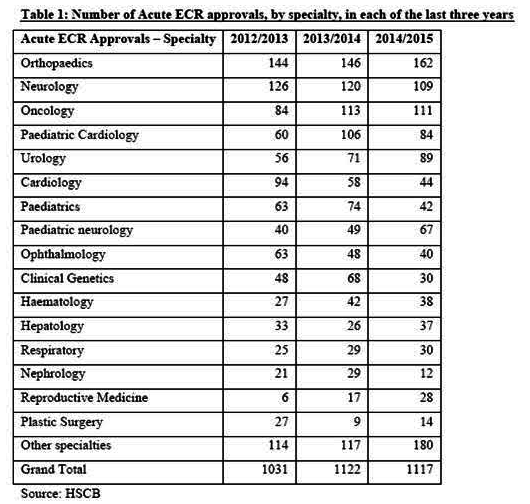 The figures show that 22 of the ECR patients were adults, with 30 ECR admissions between them. Two people under 18-years-old were admitted as ECRs, with one admission each. Aileen Uí Dhonnghaile was 24-years-old when she was transferred to St George’s hospital in London for specialist eating disorder treatment as a result of an ECR. Her first stay lasted a year and a half and two years later she returned again for a further six months. Mrs Uí Dhonnghaile says it’s important to remember that behind the figures are individual stories. She said: “From 2002 to 2006 I was being seen by various health professionals in Northern Ireland. Unfortunately none of them specialised in eating disorders so I felt quite misunderstood and at times I felt judged as well. Very often people were seeing someone who just didn’t eat and was maybe being silly or childish. When in fact that is not what was going on, it was a serious illness. Aileen Uí Dhonnghaile says improvements in out-patient services for those with eating disorders would also make a huge difference. Mrs Uí Dhonnghaile now works for the voluntary sector project the Eating Disorder Association for Northern Ireland (EDANI). It provides a helpline as well as support and advice services to people with an eating disorder and their family carers. She says she is thankful to be in a position that through her own experience she can help other people with eating disorders in Northern Ireland. HSCB and DHSSPS jointly fund EDANI £40k. However this service is in jeopardy due to the planned phased removal of DHSSPS contracts over the next three years. Ann McCann is the head of EDANI. She said: “At a time when the health department is considering whether there is a need to establish a specialist eating disorders unit in Northern Ireland, it comes as a shock and disappointment to us at EDANI that our core funding is being phased out. The department acknowledges that the services that we provide will be in jeopardy as a result of their decision to remove our funding. A spokesperson for the Department of Health said: “The core grant funding scheme is considered no longer fit for purpose and is being phased out during 2016/17 and 2017/18, with a new Innovation Scheme being developed. Its purpose is to promote innovation across health and social care by voluntary, vommunity and social enterprise (VCSE) organisations in Northern Ireland. The public consultation closes on June 3 2016.